Last weekend I made my first visit to a Divine Science church, something I’ve intended ever since beginning to work on the New Thought movement as context for the writings of Sarah Stanley Grimke. As with the recent connection to local Unitarians for the same reason, it was a very pleasant and encouraging experience that I intend to repeat. Among the many rare treasures now available on IAPSOP is a near-complete run of the journal Harmony, published in San Francisco from 1888 through 1906 under the editorship of Malinda Cramer, who more than anyone else is considered the founder of Divine Science. Several pieces of circumstantial evidence had suggested a connection between Sarah Stanley Grimke and Divine Science. Her friendship with Miranda Rice had begun in Massachusetts when both were students of Christian Science, and the year Rice moved to California, 1885, was the first year that Sarah visited there. Two years later, Sarah wrote to her daughter about Rice returning to Massachusetts and still being in touch by correspondence. According to The Encyclopedia of Cults, Sects, and New Religions, Malinda Cramer had sought a cure for her illnesses for several years but “In 1885, Cramer finally found her cure under the ministration of Miranda Rice, an early student of Mary Baker Eddy who had left the Church of Christ, Scientist, to open the first Christian Science Practitioner’s office on the West Coast.”(p. 283) Although Divine Science was founded in the San Francisco Bay Area, it found many disciples in Denver and after the great earthquake and fire of 1906, Denver became the movement’s headquarters. Since Sarah belonged to the Hermetic Brotherhood of Luxor which was headquartered in Denver when The Light of Egypt was published, it seemed likely that she was acquainted with Divine Science leaders in both California and Colorado. Generally the New Thought aspects of the Church of Light heritage seem more related to Divine Science than to Unity, Christian Science, or Religious Science. The availability of Harmony online provides the first evidence of any friendly notice of Grimke’s writings during her lifetime. 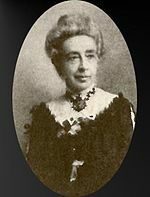 Heretofore I had found dismissive references to her in the Christian Science Journal in 1885 and 1886, but no friendly references in any periodical. In April 1893, the conclusion of a multi-part article by A.P. Barton of Kansas City, entitled “Why Are We Here?” quoted Sarah briefly. Because Sarah left the US in 1888 according to correspondence in the Grimke files at Howard University, we can find no record of her presence in either California or Colorado in the pages of Harmony. But we can find, here and nowhere else as yet, evidence that she was being read in New Thought circles during her lifetime.